Which Parts of the Eyes Are Associated with Which Eye Diseases? The eyes are small, but they have many parts including the eyelids, sclera, cornea, lens, optic nerve and retina. We depend heavily on our vision. When something goes wrong, the eyes are disproportionately affected. For example, a senior at risk of heart disease is also at risk of an ocular arterial or vein occlusion. Also, the macula requires a yellow-colored nutrient (lutein and zeaxanthin) found in certain vegetables such as green leafy vegetables, red, yellow and green peppers, corn and eggs. And antioxidants found in fresh fruits and vegetables have been shown to reduce oxidative eye damage and eye disease. In this article, we start with the outermost parts of the eye and move toward the back. Light first enters the eye through the cornea. The cornea helps focus the light. The iris lets in the right amount of light by adjusting the size of the pupil. The lens further focuses the light. Light hits the retina, which is neural tissue. The retina converts images into electronic signals. The optic nerve transmits the signals to the visual cortex, where the brain interprets vision. A thin fold of skin, the eyelid covers and protects the eye. Each eye has an upper (palpebral) and lower (blepharal) lid. Eyelids close and open either deliberately or as a reflex. Eyelids protect the eye from dust, perspiration, and debris. A row of eyelashes (small hairs) assist in protecting the eye. Eyelids are also responsible for spreading moisture on the outer surface of the eye. They close during sleep to prevent drying out. Eyelids are vulnerable to infection and oil duct blockages. A daily or twice-daily eye cleaning with baby shampoo and warm water helps stave off problems. Blepharitis is an infection or inflammation of the eyelids. It may be caused by allergies, bacterial or viral infections, insect bites, chronic dry eyes and irritants such as makeup. A chalazion is a bump on the eyelid. A blocked meibomian gland is the cause. Unlike a stye, a chalazion is not due to an infection. Styes are inflammation or infection of an eyelash follicle or a meibomian gland. They are painful and may become worse without treatment. Pink eye is also called “conjunctivitis,” meaning “inflammation of the conjunctiva.” The viral form is highly contagious. Sometimes a bacteria is the culprit. Conjunctivitis may also be caused by allergies and drug interactions. Eyelids play a role in dry eyes. Older individuals may have incomplete blinking and lids slightly open while sleeping. Eyelid exercises such as gently massing the eyelids and acupressure points on the orbit of the eyes can help. Staring at electronic screens reduces blink rate causing or aggravating dry eye problems further. Therefore, put attention on blinking more frequently while using electronics. Take breaks to blink and do eye exercises regularly. Covering 5/6ths of the eyeball, the sclera is a thick membrane of connective tissue. The sclera helps maintain the eyeball’s shape. The muscles within the sclera help you move your eyes. The most common eye condition related to the sclera is conjunctivitis, which is an inflammation often due to infections by bacteria (including chlamydia), viruses, or fungi, as well as chronic dry eyes which makes one more vulnerable to eye infection. Like the windshield on a car, this clear, dome-shaped tissue allows light into the eye. The cornea is located over the iris and has 5 layers. The outermost layer provides protection and heals quickly. The inner layers provide structure. Patients with Fuchs’ corneal dystrophy have a genetic flaw. Their corneal cells do not renew themselves. Keratoconus is a bulging of the cornea. The cause may be from tears in the dua layer, allowing fluid to build up. Or, the Bowman’s Layer may have oxidative damage. A pterygium is a raised, cream-colored bump on the nasal side of the white of the eyes. If it spreads into the cornea, it is called a Pinguecula. Astigmatism is a defect in the shape of the cornea often from birth. Astigmatism affects the accuracy of refraction of light to the retina. The iris contains pigment that dictates eye color. The muscles of the iris help change the size of the pupil in response to light. Anterior uveitis or iritis is an inflammation of the middle layer of the eyes, and untreated may result in glaucoma, cataracts and/or macula edema. This layer includes the iris (colored part of the eye) and the adjacent tissue, known as the ciliary body. Redness, pain, tearing and light sensitivity are signs to consult an eye doctor. Posterior uveitis (choroiditis) is a more serious form of anterior uveitis. The black round hole in the center of the iris is the pupil. Like the aperture on a camera, the pupil expands (dilates) in dim light. In bright light, the pupil contracts. Therefore, with assistance from the iris, the pupil controls how much light gets into the eye. The lens is a transparent disc that focuses light from objects onto the retina. It is positioned behind the iris. The lens is flexible, and its curvature is controlled by ciliary muscles. The amount of curvature varies as the eye focuses on objects near and far. In this way, light from objects at various distances from the eye are turned into properly focused images on the retina. Lenses may lose their transparency with age. This results in a condition called cataracts. Over time, cataracts can significantly effect how clearly one sees. Cataract surgery is the typical cure. In the early stages natural eyedrops such as the cineraria eye drops may stall and reverse the cataracts potentially, particularly in the early stage. In middle age, lenses often lose some of their flexibility. Therefore, focusing on close-in objects is difficult. This common condition is known as presbyopia. Reading glasses and bifocal/trifocal/progressive lenses are typical solutions. Eye exercises, dietary changes, and supplements can help strengthen the eyes. Astigmatism is a refractive error in the cornea. The lens does not transmit light onto the retina evenly. Aqueous Humor is a clear watery fluid that fills chambers between the cornea and the lens. Aqueous humor is continually produced and is drained at a rate that maintains a steady pressure (the “intraocular pressure”). Therefore, aqueous humor helps the eye maintain its spherical shape. Elevated intraocular pressure is associated with many cases of glaucoma. A puff of air or pen like instrument at the eye doctor’s office screens for this. High intraocular pressure associated with glaucoma appears to be caused by the inefficient drainage of aqueous humor through the trabecular meshwork. Called “the silent thief” as there are typically no associated symptoms a patient would notice until loss of peripheral vision occurs, glaucoma causes significant damage to the optic nerve if left untreated. Regular dilated eye exams are crucial, especially in seniors. Myopia makes distant objects blurry. The eyeball is too long, causing the image to focus in front of the retina. For people who are highly myopic, they are at a higher risk of vitreous tears and detachments, retinal tears and detachments, and myopic macular degeneration. Vitreous Humor is a transparent jelly-like fluid that fills the interior of the eye between the lens and the retina. Vitreous humor is not affected directly by circulation and but the fluids are replenished. Since there is no blood circulation in the Vitreous humor, any stray cells or byproducts of inflammation that happen to get into the fluid may stay there. The body does put phagocytes cells in the fluid that do help over time break down debris. This rubbish may form clumps that cast shadows on the retina. These are called “floaters“. For various reasons, the vitreous humor may pull away from the retina. This condition is called Posterior Vitreous Tear or Detachment. PVD can cause flashes or a sudden increase in floaters. If one notices this, they should consult their eye doctor. The retina is a multilayered membrane inside the eye that converts light from the lens into electrical impulses that the brain can process. The retina contains millions of light-sensitive cells. When images produced by the lens fall on these cells, the resulting electrical impulses are sent to the brain to be interpreted as vision. Hardening of the arteries can affect the blood vessels leading to the retina. If one becomes blocked, part of the retina cannot get enough oxygen. Maintaining a healthy heart is crucial to preventing Retinal Artery Occlusions. Retinal Vein Occlusion is when a blood vessel blocks another blood vessel. Circulation back to the retina is blocked, causing hemorrhaging. The risk factors are the same as for stroke and cardiovascular disease. Cone Rod Dystrophy is usually inherited. The body cannot produce enough of the right proteins for proper functioning of the cones (for fine details and color) and/or rods (for night and peripheral vision). Diabetic Retinopathy affects half of all Americans who have diabetes. Blood sugar imbalances damage the retina. The damage may creep up over time. Therefore, a team of health care professionals must work closely with the diabetic patient to regulate blood sugar and screen for vision problems. Retinitis Pigmentosa is a genetic disease that causes poor night vision and diminished peripheral and color vision. This retinal disease is typically detected in young people initially. Lattice Degeneration is atrophy of the peripheral retina. The weakened blood vessels make a lattice pattern. Tears and holes appear. Central Serous Choroidopathy occurs mostly in young males. Fluids leak into the retina, suddenly distorting vision. Sensitivity to light is a symptom of several eye conditions. A chemical reaction at the back of the eye assists during light transitions. Light sensitivity is often a common symptom of cataracts, as well as dry eyes, corneal issues and retinal thinning. The macula is a small area near the center of the retina that provides the clearest vision. For example, reading, watching TV, and recognizing faces depend mostly on central vision. If the macula is damaged, for instance by macular degeneration, this central, high-resolution vision is reduced or lost. Macular degeneration (Age-Related Macular Degeneration) is common in seniors. The breakdown in the macula may be caused by free radical damage, as well as poor circulation and digestion. It may be genetically related particularly for those who get it at a younger age. Good nutrition, supplementation, and a healthy lifestyle may prevent this eye disease or reduce the risk of vision loss for those with this condition. The Amsler grid can be used at home between eye exams to check for macular degeneration. The more advanced form of macular degeneration is called “Wet AMD”. Choroidal neovascularization means the eye grows new, unwanted blood vessels. Blindness is a likely outcome without treatment. Best’s Disease is a genetic disease that appears in childhood. The macula breaks down over time. Epiretinal Membrane (macular pucker) can cause the retina to wrinkle, distorting vision. Occurring mostly in seniors over age 75. Macular puckers often occurs alongside other eye conditions. The optic nerve is a bundle of nerve fibers that sends visual information from the retina to the brain. Damage to the optic nerve is irreversible. Any progressive eye disease that damages the optic nerve must be slowed, stopped, or reversed to preserve vision. Eye diseases that damage the optic nerve include glaucoma, Leber’s Hereditary Optic Neuropathy, Optic neuritis, optic nerve atrophy, and Optic Nerve Drusen. 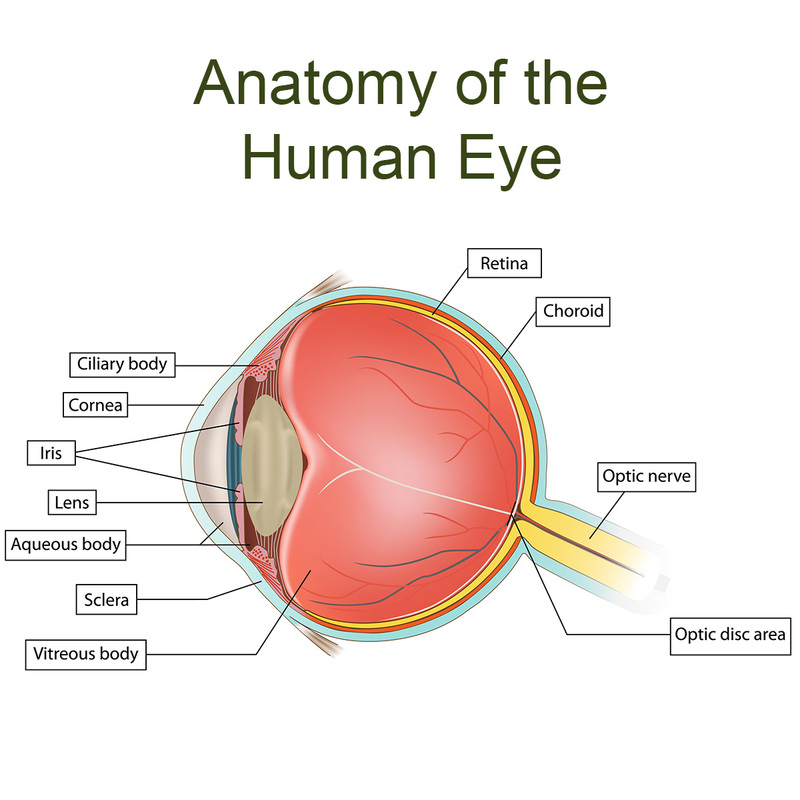 Eyes are composed of complex and delicate tissues. They require a significant amount of nutrients to maintain maximum health, even in the case of genetic eye diseases. Therefore, a healthy diet, regular exercise and targeted supplement help maintain healthy vision. Exciting stem cell research is in progress that may offer treatment for regrowth of lost retinal and optic nerve cells over the next 3-5 years.